We re-surveyed the reefs on Holbourne Island offshore from Bowen and the Abbott Point Coral Terminal recently. Cyclone Debbie had devastated the reefs around much of this island and we were looking forward to see how recovery was going. 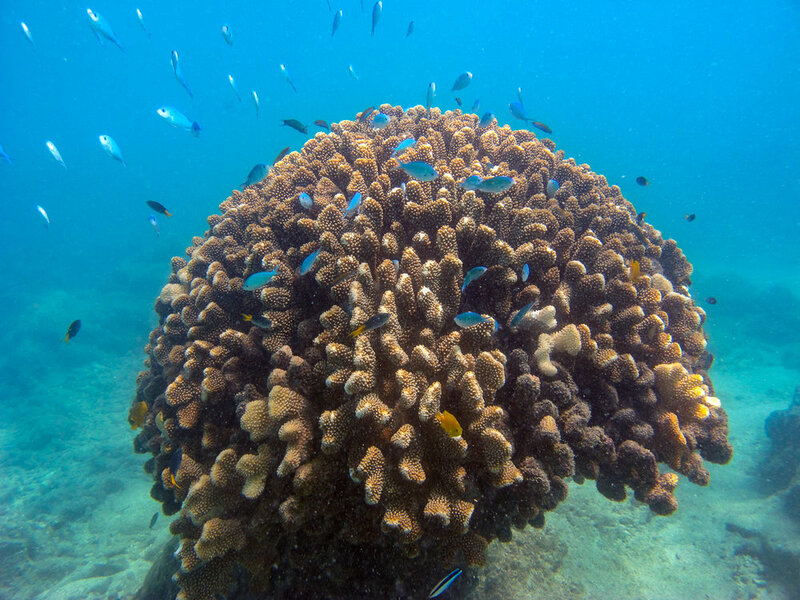 It had been 20 months since the cyclone tore these reefs apart and some of the broken and damaged corals were recovering well, especially the branching Millepora fire corals. There were also still some good corals on the deeper parts of the reef at about 10 metres depth and a few hardy corals in shallow water that had miraculously survived the cyclone. However, we were surprised to see that parts of the reef that had been stripped bare by the force of the cyclone waves did not yet have any new coral recruits on them. Normally we would expect to see many new recruits on such bare reef substratum within a year or so of the cyclone but nothing was visible. The work was lightened by visits from several groups of large manta rays. One group of three mantas swimming nose to tail made about four visits over about 15 minutes, swooping close around us before going off about their business. It is always such a huge thrill to see manta rays when we are diving. As usual there were a few beautiful nudibranchs that temporarily distracted us from our work! Meadow of bottlebrush Acropora corals that have survived the cyclone and recovered from mild damage at about 10m depth. Close approach from a large manta ray!